The Swiss Ramble: Has The Old Lady Been Rejuvenated? Although Juventus only finished 7th in Serie A last season, there is no doubt that they have come a long way since the dark days of Calciopoli just four years ago. Having been heavily punished for their role in that scandal, when they were relegated to Serie B and forced to start the following season with a nine-point deduction, the bianconeri have manfully fought their way back to the upper echelons of the top tier. Until this year’s blip, they improved every year on the result of the previous season, starting by winning Serie B by a comfortable six points in 2007, then surprising most pundits by finishing third in their first season back, followed by an impressive second place in 2009. Relegation was an unprecedented indignity for the Old Lady of Turin, as the club is affectionately known, as it had had never before been out of Italy’s top division in its 109-year history. Very far from it in fact, as Juventus have a roll of honour as long as both your arms, having won the Champions League twice, 29 Italian championships (though one of these was revoked and another one not assigned), three UEFA Cups and one Cup Winners’ Cup. On top of that lot, the club’s website claims that they are the most popular team in Italy with 12 million supporters, while they boast of a barely credible 170 million fans worldwide. Their fall from grace arose from the match-fixing scandal that emerged in 2006, after police uncovered a series of telephone interceptions that showed some major teams attempting to rig results by selecting referees that would be favourable to them. The basic facts are that Milan, Fiorentina, Lazio and Reggina were all given points deductions, but only Juventus were condemned to relegation, as they were most deeply implicated in the murky machinations. This is clearly a profoundly emotional subject for all Italian football fans and is one that even now refuses to die down with the recent discovery of more tape recordings suggesting that Inter were also heavily involved in this outrage. The role of this blog is not to apportion degrees of blame, but to look at the Juventus response to the body blow that they received. One immediate result was that the team that “won” the scudetto in 2006 had to be broken up, partly through players wanting to leave for greener pastures, partly out of financial necessity, so stars such as Zlatan Ibrahimovic, Patrick Vieira, Lilian Thuram, Gianluca Zambrotta and Fabio Cannavaro all left Turin. 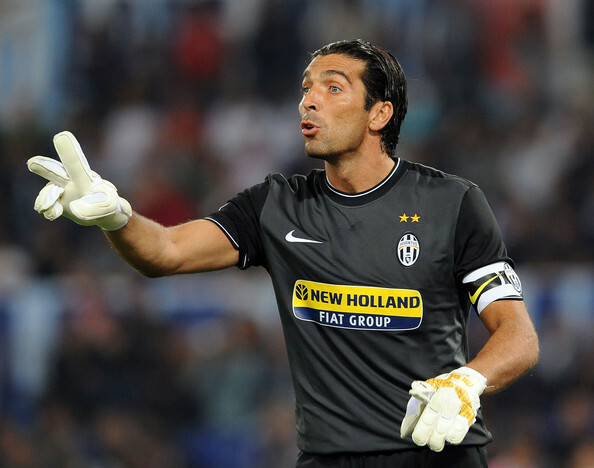 On the other hand, some players remained loyal to the club’s colours, forever cementing themselves into the hearts of the Juve faithful, including Gigi Buffon, Pavel Nedved and the incomparable Alessandro Del Piero. As they say, “when the going gets tough, the tough get going”, so it was all change at Juventus. The club’s majority shareholders, the Agnelli family, brought in John Elkann, the grandson of the legendary avvocato Gianni Agnelli, to sort out the horrible mess and he wasted little time in instigating a radical clear-out, sacking the former management and recruiting a new chief executive in the shape of Jean-Claude Blanc, whose sporting experience included the Winter Olympics, Tour de France and the French Tennis Federation. 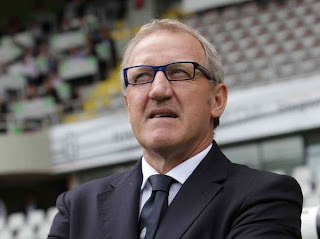 The “French Connection” was further strengthened when Blanc hired World Cup winner Didier Deschamps as the new manager, replacing England’s very own Fabio Capello. Although Blanc has attracted criticism for not being a football man, it has to be remembered that he took control of Juventus during the most turbulent period in the club’s history. The meltdown on the pitch could easily have been accompanied by financial disaster off it, but Blanc and his team managed to steady the ship and restore confidence. "Jean-Claude Blanc: Allez les bleus!" In 2007 the new board of directors formulated a medium-term plan that would permit the relaunch of “Newventus”, if you will, as a leading football club in Europe, while strengthening its financial position. Their mission was to be the very benchmark of a modern football company: excellent in sport, close to the fans, but managed with great professionalism and a focus on commercial opportunities. To that end, the club has demonstrated a ruthless streak whenever it has looked like their objectives were not being fully met with Deschamps leaving by “mutual agreement” after winning promotion and Claudio Ranieri being sacked after losing out to Inter in the championship, including a fatal two-month run without a victory. Ciro Ferrara, who had been responsible for the youth sector, replaced him, but he lasted less than a season before being sacked after the club failed to qualify for the knockout stages of the Champions League. His replacement, Alberto Zaccheroni, was only given a four-month contract, which unfortunately for him included the ignominious exit to Fulham in the Europe League semi-final. The swings and roundabouts continued this summer with Elkann effectively demoting Blanc, though he retained some duties, by appointing his cousin Andrea Agnelli as chairman. Something of a figlio d’arte, Andrea’s late father, Umberto, was the club’s president between 2003 and 2005, while his uncle was the highly successful Gianni, so fans hoped that his arrival heralded the return of former glories. 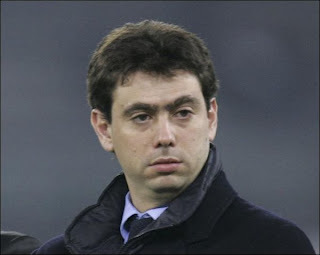 "Andrea Agnelli - a chip off the old block?" Agnelli moved quickly, raiding Sampdoria to hire Beppe Marotta as Sporting Director and Gigi Del Neri as coach. 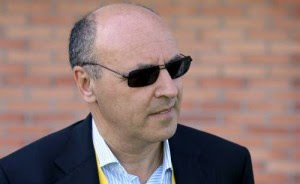 Marotta may well prove to be the more important acquisition, as he is a highly skilled, proven operator in the Italian transfer market, helping to guide Sampdoria from Serie B to the Champions League with a series of astute, cut price purchases, notably Antonio Cassano and Giampaolo Pazzini, who formed a lethal strike force for the Genoa club. So the obvious question is how close are Juventus to achieving this noble objective? The short answer is that they’re doing pretty well, all things considered. 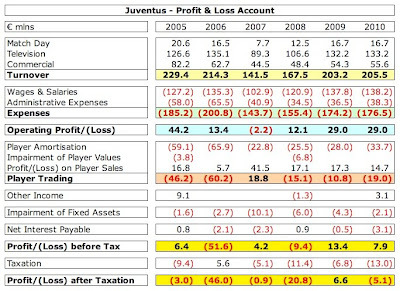 The club has only just announced its 2009/10 results (to 30 June 2010), which admittedly revealed a small post-tax loss of €5 million, but it should be noted that before tax Juventus actually posted a profit of €8 million, prior to booking hefty tax charges of €13 million (€6 million in current taxes and €7 million in deferred taxes, largely due to profits on player sales). In fact, tax has played a fairly big role in the club’s financials with pre-tax profits being made in four of the last six years, only for three of those to end up as losses after the tax bill was taken into account. The odd one out was came in 2008/09, when the results were spectacularly good, producing a €7 million post-tax profit. This is the most recent year where we can compare Juventus’ financial performance with those of other Italian clubs, as they have not been so quick to publish their 2010 accounts. So, in that period, Inter reported a gigantic loss of €154 million, which was €161 million worse than the profit that Juventus made, despite a year of unparalleled success. On the pitch, Inter finished ten points ahead of Juventus, so you could argue that each additional point cost the nerazzuri €16 million. Obviously, that’s not the only reason for the gap, but it’s definitely an important factor. Money talks. The other major Italian club, Milan, also recorded a small loss of €10 million in 2008/09, but this was boosted to a great extent by the €66 million profit made on the sale of Kaka to Real Madrid. A more realistic comparison would be the €67 million loss that Milan made the previous year. In fairness to the others, last year was exceptional for Juventus from the financial perspective, featuring revenue back up to levels not seen since before the demotion to Serie B. Despite the high revenue in 2006, the club still made a huge loss of €46 million, “thanks” to the exceedingly high costs. All that high spending must have felt a little bit like the last days of the Roman Empire, albeit taking place 400 kilometers north of the capital in Turin. Then came the annus horribilis of 2007, when relegation necessitated drastic action with the club having to desperately downsize, as revenue plummeted by over a third from €214 million to €142 million. As well as losing out on the Champions League (worth €29 million in 2006), several key broadcast and commercial contracts were renegotiated as a result of the club competing in the inferior division. There was a €14 million reduction in the value of the main broadcasting contract with Sky Italia, while shirt sponsor Tamoil and kit supplier Nike lowered their payments by €8 million and €4.5 million respectively. Furthermore, gate receipts fell by €9 million. In line with the revenue decline, Juventus were forced to cut costs, which effectively meant offloading players in order to trim the wage bill and reduce amortisation. Obviously, this produced another financial benefit in the form of a significant profit on player sales of €42 million, including a €15 million gain on Ibrahimovic when he was transferred to rivals Inter. These strenuous efforts meant that Juventus just about broke-even in Serie B, which was a notable achievement, though the following year they did report a large loss of €21 million, as they ramped up their spending in order to be competitive on their return to Serie A. Given that they finished third that season, you have to say that this gamble worked out very well, as it produced significant revenue growth in 2009 derived from the Champions League qualification. Before further commenting on the revenue, I should explain that the revenue figures in my analysis are different from those quoted by Juventus. In order to be consistent with other clubs, I have followed the definition used in the Deloittes Money League. For example, their latest report, which was based on 2008/09 results, excluded the following items: (a) gate receipts given to visiting clubs €1.7 million; (b) TV income given to visiting clubs €18.2 million; (c) profit from player sales €17.3 million. Adding the total adjustments of €37.2 million to the Money League revenue of €203.2 million gives the €240.4 million revenue reported by Juventus. Similar adjustments were made in other years, though I have had to pro-rate the 2009/10 figures, as the Deloittes report for this year has not yet been issued. Looking at the comparison with other top clubs, the initial impression is reasonably positive, as Juventus are placed 8th in the Money League with the highest revenue of any Italian club, though Inter and Milan are only just behind with €197 million apiece. However, on closer inspection, it becomes clear that not everything is rosy in Juve’s garden. First, the other clubs have grown their revenue at a much faster rate than Juventus. In fact, before relegation Juve were as high as 3rd in the Money League. Second, their income is a long way short of their competitors abroad, especially the Spanish giants, Real Madrid and Barcelona, who generate around €400 million, which is around twice as much revenue as Juventus. At the risk of stating the obvious, this makes it difficult to compete, especially when that shortfall in turnover is suffered every single year. Two other observations really smack you in the face. Juve’s match day revenue of just €17 million is extremely low, so much so that it’s actually the lowest of any team in the top twenty clubs listed in the Money League, representing only 8% of the club’s total revenue. 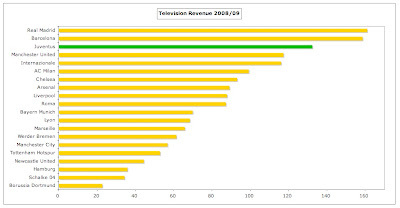 On the other hand, their television revenue of €132 million is substantial – the third highest in the list, accounting for a meaty 65% of total revenue. Like other Italian clubs, Juve’s revenue profile has become increasingly unbalanced and is heavily dependent on broadcasting income, but in their case it is particularly exaggerated. As a matter of fact, this is the highest level of reliance on a single revenue stream for any Money League club. Up to now Juventus have benefited from selling their TV rights individually to Sky/Mediaset, with a deal worth €112 million a season, though this was netted off to €100 million once the mutuality agreement was considered. As from the 2010/11 season, this has been replaced by a return to a centralised collective deal, which Juventus have estimated will lead to a €7 million reduction in revenue (to €93 million) in the first season, but only €2 million (to €98 million) the following year. This is maybe not quite as bad as some had feared for a couple of reasons. First, the total money guaranteed by the new media rights partner Infront Sports will be approximately 20% higher than before at over €1 billion a year. Second, the complicated distribution formula tends to favour the big clubs: 40% equal share; 30% based on past results (5% last season, 10% last 5 years, 15% historical results up to 5 years ago); and 30% based on fan base and city inhabitants. 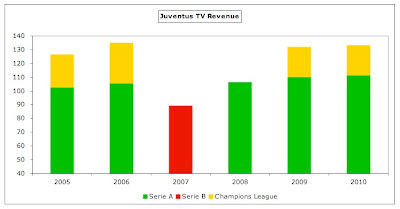 However, as we have seen, the failure to qualify for the Champions League will have a major detrimental effect on Juve’s revenue – just look at the difference between the TV income in 2008 and the other years. Last season UEFA distributed €21 million to Juventus, but that was relatively low, because they did not progress further than the group stages. If we were to assume that they reached the quarter finals, they would receive approximately €28 million from a combination of participation fee, performance bonuses and TV pool. On top of that, gate receipts are worth €3-4 million, while additional sponsorship payments are linked to success in Europe. Little wonder that Juventus finance director, Michele Bergero, advised supporters that “Champions League participation is the key to a healthy balance sheet.” Although prize money has been increased in the Europa League this season, it’s still very much the poor relation with prize money of only €6.4 million available to the eventual winners. As Bergero said, “it’s worth more from the sporting aspect than economic.” Given the financial difference, the possibility of Germany taking a Champions League place from Italy next season is of clear concern. Although the most popular club in Italy, Juventus have struggled to convert this support into meaningful match day revenue. This is an issue for all Italian clubs, but especially Juventus, even though they have managed to grow this revenue stream from the €13 million in the first season back in Serie A to €17 million last year. This is just behind Roma’s €19 million, but is far below Milan (€33 million) and Inter (€28 million), who generate almost twice as much revenue at San Siro. The comparison is even worse abroad with Manchester United and Arsenal earning over seven times as much match day revenue with €128 million and €118 million. Not only do Juventus have the lowest average attendance of the top European clubs in the Money League at around 23,000, but this was only the 11th highest in Serie A last season, lower than clubs like Bologna and Palermo. In comparison, Inter’s average crowd was over 49,000, while Milan and Roma averaged 43,000 and 41,000 respectively. To be fair, Juve’s attendances have been rising every season since they were promoted, but there were worrying signs during this summer’s sales campaign. As of 31 July, only 13,551 season tickets had been sold, compared to 17,329 in the same number of days the previous year. Of course, Juventus have been limited by the capacity of their ground, which is very low at 28,000, only underlining the importance of moving away from the Stadio Olimpico. To that end, they have begun construction of a new 41,000 capacity stadium on the site where the hated Stadio Delle Alpi once stood. 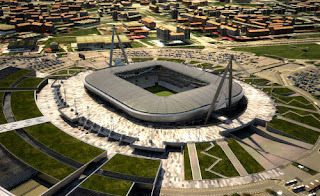 Juventus will be the only Italian football club to own its own stadium, which is scheduled for completion in July 2011, though many others are keen to emulate them. This development will give them a better chance of competing financially with Europe’s other great clubs. Juventus have estimated that this move will more than double match day income to €40 million per annum, driven by four distinct sources of revenue: naming rights, premium seats, standard seats and facilities and events. The premium seats are particularly important, if you consider that Arsenal make 35% of their match day revenue from just 9,000 premium seats at the Emirates. Significantly, all of this income will go directly to the club, as they will no longer have to share it with Torino or the local council. Nevertheless, it’s far from certain that Juventus will be able to fill their new stadium, given their current low attendances, though the club point out that they did average around 36,000 the last time they played in a larger stadium. Getting the pricing and package offered to supporters will be critical to the club optimising match day revenue, but there are some encouraging signs with 1,100 premium seats already sold (about 35% of the total available for sale). Another key part of the Juventus business plan is a modified commercial strategy, known as “Less is more”, which aims to increase the average value of contracts by creating more stable, longer-lasting relationships with a select group of companies. This is in marked contrast to the approach adopted by Inter and Milan, who have considerably more marketing partners. The recent increase in commercial revenue to €56 million has been used to justify this policy, but it’s still lower than the income they used to receive before being tainted by Calciopoli. 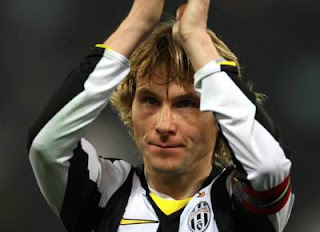 "Milos Krasic - the new Nedved?" In 2005 Tamoil signed a five-year €110 million shirt sponsorship deal that was believed to be the highest in football history at €22 million a season with a possible five-year extension worth even more. This was more than twice the size of any other deal with an Italian club, but was cancelled in the light of the scandal. It was quickly replaced with a three-year deal with the New Holland Group (part of Fiat), but this was only half the value at €11 million a year. The new sponsorship deal signed with Betclic this summer is fairly innovative, as it only covers the famous black and white home shirt, but it is another decrease from the previous deal at €16 million for two years. The payments were going to be split €7.5 million in 2010/11 and €8.5 million in 2011/12, but the first year has been reduced to €6.5 million following the club’s failure to qualify for the Champions League. So far the club has not managed to secure a sponsor for the second shirt, so it might have to market this for a limited period (or even single matches). In contrast to the numerous changes in shirt sponsors, their kit supplier Nike has remained loyal with their 12-year deal running until 2015/16 for a minimum of €12 million a season. As Giorgio Brambilla of sports marketing consultancy Sport+Markt explained, “Juventus have had moments of great difficulty off the field and now they are having them on it, but they are still one of soccer’s most important brands.” The club is aiming to consolidate that brand around the world and has undertaken tours of USA, China and Australia in the past few years in pursuit of that objective. What Juventus have done very well is to control their costs in line with the rise and fall of their revenue, especially the wage bill, which is by far the largest item in expenses. In fact, as far back as 2006 John Elkann spoke about introducing a salary cap as part of their new way of doing business. Total salaries last year were more or less the same as the prior year at €138 million, split between players €127 million and other staff €11 million. These have been increasing ever since promotion, but they are still only just higher than the 2006 wage bill, which is a rare event in a football world that has been subject to huge salary inflation. Even so, Juventus still have the third highest wage bill in Italy, according to a survey published by La Gazzetta dello Sport, but they are miles behind Inter, whose €205 million is nearly 50% more. This has produced a respectable wages to turnover ratio for Juve of 67%, just below the 70% upper limit recommended by UEFA. The same Gazzetta report listed the highest paid players as Gigi Buffon, Amauri, Del Piero and Giorgio Chiellini, but taken as a the whole the salaries seem on the low side for this day and age. It should also be noted that Beppe Marotta’s activity during this summer’s transfer window will cut the wage bill by around €25 million (20%), which will help compensate for the lack of Champions League money in the coming season. Furthermore, many players’ contracts expire next summer, including high earners like Del Piero, Hasan Salihamidzic and Nicola Legrottaglie, so that could be another €10-15 million reduction. Obviously these players will need replacing, but these are likely to be with cheaper alternatives. "Marchisio - one of the young guns"
Cheap is not the adjective that comes to mind when looking at the remuneration of chief executive Jean-Claude Blanc. We don’t yet have the details for 2010, but the 2009 annual report lists this as an amazing €2.7 million, comprising salary €0.6 million, bonus €1.6 million and other payments €0.5 million. Even though the club’s previous annual report took great pains to praise the “passion, competency and professionalism” of the management, this still seems pretty steep to me. Player amortisation has also been on an upward trend, rising €6 million to €34 million in 2010, though this is a lot less than the €66 million peak in 2006. This follows on from the fairly wasteful transfer campaign in 2009, but is likely to come down after this summer’s shrewd moves. In any case, it’s nowhere near as high as other top clubs, which have spent considerably more in the transfer market: Barcelona €71 million, Real Madrid €64 million and Inter €50 million. The cost was also inflated in 2008 by a €7 million write-off following Andrade’s retirement due to a serious knee injury. 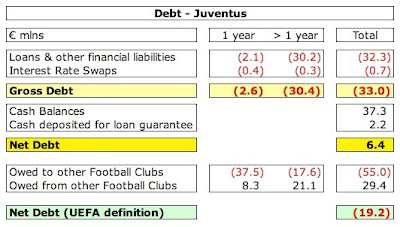 Actually, write-downs have had quite a big impact on Juve’s accounts, amounting to €26 million over the last four years, including €15 million on the company’s video archive (€7 million in 2007, €5 million in 2008 and €3 million in 2009) and €2 million in 2007 for stadium design costs, when those plans were cancelled after the 2012 European Championships were not awarded to Italy. Bearing in mind Juve’s focus on the bottom line, it’s not surprising to see that they have not spent an enormous amount on new players. Although it is difficult to find accurate figures for transfer fees, especially for Italian clubs with their mixture of permanent moves, loans and player sharing agreements, those used on Transfermarkt suggest that Juve’s net spend over the last decade was €194 million, which would mean less than €20 million a season. The club has also made good profits on player sales, averaging €16 million a season over the past three years. What we can say with more confidence is that Beppe Marotta has performed better than his unloved predecessor, Alessio Secco. Indeed, much of this transfer campaign would appear to be about correcting previous mistakes. The 2010 management statement spoke of a net investment of €26.6 million, but this simple fact disguises a great deal of activity. Marotta got rid of Poulsen, Almiron and Molinaro for good money, while allowing Cannavaro, Camoranesi, Zebina and Trezeguet to leave on free transfers, thus removing them from the payroll. OK, Diego was sold at a large loss, but, as we saw with the Ibrahimovic transfer, things ain’t what they used to be in the transfer market. "Diego - time to cut your losses"
Acquisitions have been targeted at obvious areas of weakness, so Leo Bonucci and Marco Motta have been brought in to improve a suspect defence, while the flanks have been strengthened with Milos Krasic and Jorge Martinez to suit Del Neri’s playing style. 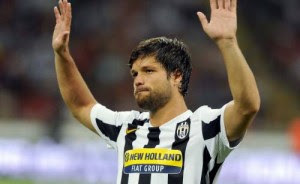 Marotta has also made good use of the loan system, picking up Alberto Aquilani and Simone Pepe “on the cheap”. Importantly, most of the purchases have been made with payments split over the next three years, so the impact on this year’s cash flow is not overly damaging. This prudence is also reflected in the club’s vision of “successfully developing young players” with the goal of progressing them from the youth squad to the first team. This objective is supported by an annual budget of €6 million plus a €5 million investment to improve the Vinovo training centre. It is early days to see whether this approach will bear fruit, but the Juventus Primavera team has won the prestigious Viareggio tournament five times in the last eight years. Given the focus on financials, you would not expect the club to carry much debt and you would be right. In fact, the “net financial position” (as Juventus describe it) is a positive €6 million, as cash balances of €39 million more than cover bank loans (primarily for the new stadium) of €33 million. In fact, the last time the club had net debt was in 2006 and that was only €13 million. Since then, the club has been net cash positive every year: 2007 €22 million, 2008 €11 million and 2009 €26 million. Some analysts mention debts of €178 million (£147 million), but that is the figure for total liabilities, thus including amounts owed to trade creditors and employees, and is clearly over-stated. However, UEFA’s definition of net debt also includes amounts owed to and from other football clubs and this would bring the net debt to €19 million, though this is still exceptionally low. The staggered payment of transfer fees is a recurring element of Juve’s strategy with the amounts owed to other football clubs ranging between €46 million and €55 million in the last three years. In order to avoid going into potentially ruinous debt in 2007, Juventus increased its capital by €105 million by issuing 81 million new shares (two for every three owned). The largest shareholding is now the 60% owned by Exor Spa, the Agnellis’ holding company, followed by 7.5% with the Libyan Arab Foreign Investment Company. However, Juventus are not bankrolled by the Agnelli family in the same way that Inter are by Massimo Moratti and Milan by Silvio Berlusconi. "Will Del Neri get it right?" This leaves them in pole position among Italian clubs to meet the new challenge of UEFA’s Financial Fair Play Regulations, which will ultimately exclude from European competitions those clubs that fail to live within their means, i.e. break-even. These will be implemented in the 2013/14 season, though the monitoring period will cover the preceding two reporting periods, 2011/12 and 2012/13, so other major clubs like Inter and Milan are under pressure to rapidly eradicate their losses. "Marotta - the future's so bright, I gotta wear shades"
That will indeed be crucial to the club’s future success, as will the new stadium. While the club’s “business project with a long-term vision” has undeniably left them in the strongest financial position of the major Italian clubs, they now need to match those heights on the pitch. It’s too early to say that the Old Lady is singing again, but if you listen carefully, you might just hear her warming up in the wings. Well written! Thanks for this. 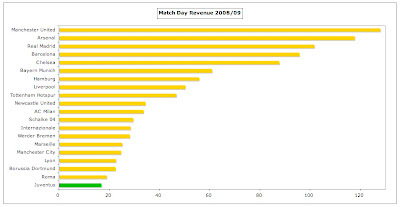 I however have question in regard to match-day revenue. "Juventus predict that a-fully-owned stadium would generate around 40 mil E of revenue". How, in the world, Real Madrid, Barca, and Arsenal could book about 100 mil E per match day? True, their stadium are bigger. But are the differences only driven by stadium capacity? Do they have higher (sold) premium seats? - higher capacity, e.g Manchester United's Old Trafford is 76,000, which is almost double the size of Juve's new stadium. - other facilities, e.g. restaurants. Juve are preparing for the storm, in 2012 when the new financial regulations come in the in debt clubs will be in serious trouble. In addition the spanish and english leagues will implode since they all operate on huge amounts of debt. Nice read, just like your other postings. I would love to hear your point of view on former Dutch powerhouse Feyenoord, who are now in big financial problems. It's been like this for years, but it doesn't seem to get better and just this week the club accepted a 10 million loan from an investment company that needs to be payed back next season. They've ofloaded most of their expensive players, didn't buy any new players this year and had a good season resultwise last year. Their stadium is mostly packed, so one wonders why they still expect to lose 2,5 million next season. Can you offer some clarity? What I find bemusing is that despite the return of a league-wide TV rights deal Juventus will still earn more than Arsenal. Let's wait for soon-to-be-published Arsenal figures to see if we've come closer though but even if there's progress one'd expect the revenues to be more in line with the respective appeal and success of both clubs in the recent years. And I admit I was flabbergasted by the €22M/year deal for the shirts sponsorship. Now wonder Emirates are crowing with the deal they got from Arsenal: "Our sponsorship deal with Arsenal is spread over a number of years,” he added. “Annually it comes to around $8m, a fantastic bargain.” (from http://www.arabianbusiness.com/594726-emirates-keen-to-renew-arsenal-sponsor-deal). Emirates fully know how much of a bargain it is since they agreed a €60M deal over 4 years for AC Milan's shirt sponsorship deal. And it's not only the shirts, Liverpool and United get £20M/year from their stadium naming rights. If Arsenal could renegotiate those deals today the sponsor(s) would have to pay over €40M/year instead of those paltry €6M. Unfortunately we'll have to wait until 2014 (and then 2021) to be able to close the gap. It gives Juventus and the likes a few years before we'll be out of their reach financially. Actually i find it facinating that an arsenal fan has the balls to talk rubbish about a team like Juve given arsenals standing in world football. If we juve played against arsenal today, the result would not be pretty for arsenal. Another brilliant article. Congratulations on your call up to the football weekly panel too! I was quite surprised to read that you doubt Juventus could fill their new stadium. It is of a modest size and you yourself pointed out that they averaged 36,000 spectators at the despised old Deli Alpi. Surely with a brand new, infinitely better designed stadium like the Juventus Arena undoubtedly is, I would be optimistic (or is that pessimistic, given that I am a Rossoneri fan?) that Juventus could achieve 41,000 seats on bums. The board seem to have backed themselves too, seeing as they have designed the stadium with potential for considerable expansion of the new arena. And why not? They can draw from the largest fan base in Italy and are situated in one of the largest cities in the country, and, unlike many of the other large teams, don't have a strong, cross-town rival with which to compete for custom. Another thing you mentioned was just how crucial it is for Juve’s business model to reach the Champions League next year (I couldn’t agree more)and the possibility Serie A may lose a spot in next year's competition. In fact, this is a near-certainty seeing the coefficient points gained from Werder Bremen's victory over Sampdoria has already leapfrogged the Bundesliga over Serie A, provisionally, and none of the four Italian teams won their opening Europa League group games pointing towards an inauspicious European campaign for Italy. In fact, if we study the coefficient table http://www.xs4all.nl/~kassiesa/bert/uefa/data/method4/crank2011.html we can see that the Bundesliga could very well leapfrog La Liga by the start of next season too! As you probably know, the coefficients are simply the aggregate and averaged score of how well a nation's teams have done in European competitions over the past five years. However, at the start of next year, Spain's fantastic 06-07 season (3 La liga teams: Osasuna, Espanyol and Sevilla reached the semi finals of the UEFA cup, earning most of Spain’s 19 points -the highest single season total by any country since the system was introduced) will come off the scores while the Bundesliga's modest 9.5 points (their lowest total since coefficients began in 04-05) will no longer count. Assuming a roughly equal score by both leagues this year (quite possible- Germany actually outscored Spain last year 18.1 to 17.9) then Germany would go ahead of Spain by .5 points. Quite a feat for the frugal, sensible Bundesliga! Indeed, if we take an average of Scotland’s last 3 seasons and project similar scores for the '10 and '11 seasons, the SPL would have between 11 and 12 points, which would see it drop into the late twenties, on a par with the likes of Finland and the Republic of Ireland. Unfortunately, this really has to be expected when the cream of the Auld Firm are pinched by Championship sides and the median wage for a first teamer in a well run, top 6 team like Hibernian is around £1,500 a week. I believe St Mirren only have two players who earn even £1,000 a week! Unfortunately, for many SPL teams, salaries and standards are of a League Two level. In theory Juventus are in good shape. However on the field their results have been poor, the sensible signings that they made over the summer haven't worked out and the new manager is already under pressure. I agree with you that the club is being intelligently run but from a footballing point of view they have very little to show for it. I've not looked at a Dutch club yet. That's a gap that I hope to put right some time in the future. Good points on Arsenal's commercial revenue. We know that the Emirates deal was compromised by the need to get money upfront to help finance the construction of the stadium, but the terms could have been better IMO. As you say, I would expect the next deals to be substantially better. I did explore this a little more when I wrote about Celtic a few weeks ago, for the very reasons you highlighted, as the impact of the UEFA coefficients could be very damaging for Scottish football (or at least Celtic and Rangers). You're quite right that ultimately Juventus will be judged by their results on the pitch, but I think it's very early days to judge the new management team and players. My general point is that Juventus have recovered remarkably well since Calciopoli, given that they were playing in Serie B only four years ago. Expectations were probably unreasonably raised when they finished 3rd and 2nd in their first two seasons back. 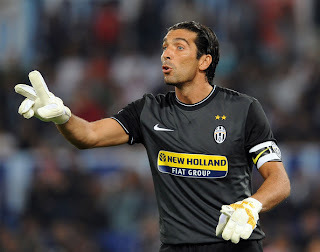 However, Juventus fans are accustomed to a lot of success, so we shall see how much patience they have. Arsenal financial report is out, thanks to your educative posts I am now able to understand most of it for the first time (but what are debentures/debenture loans?). Looks good so far except for commercial revenues which went down around 10%. Good stuff. I will post a complete review on Arsenal's results some time next week. Thanks a lot dude for posting about Juventus. About the stadium capacity : even though it is just 41,000 at the moment the stadium plans allow for additional expansion to about 70,000. The thing about juve is that it is more of Italia's club and less of Turin's club , before 2006 a number of proposals were mooted such as shifting to milan( juve supporters outnumber milan or inter supporters in milan) or play every game in a different stadium so that all of italy can go and watch Juve. As a juve fan since 1999 , it is true that we have been starved of success but at the moment everyone is willing to give time for rebuilding the club and we dont want sort term solutions. I think it will take another season or two before juve can challenge for a scudetto. "before 2006 a number of proposals were mooted such as shifting to milan( juve supporters outnumber milan or inter supporters in milan) or play every game in a different stadium so that all of italy can go and watch Juve." This is simply preposterous. I very much doubt that any such proposal could have really ever been seriously made. This could make sense in a US pro league, but in European football you don't just shuffle clubs around from one city to another. I agree with Furio, the idea of Juventus becoming a travelling circus was just a pipe dream i think. Have you ever thought of posting about the crater that is Valencia's finances? I think they would shock even you! @furio : I said that they were just thinking about it, but the fact is Juve have more support in milan than ac milan or inter. Great article. It really makes you wonder why other clubs can't achieve similar levels of financial stability/sustainability considering they possess many of the things Juventus are currently lacking (high match-day and commercial revenue, consistent CL qualification, and the spikes in revenue courtesy of trophy producing seasons). Despite all the troubles listed in your article (recent relegation, no CL), financially speaking, Juventus are already ahead of their domestic rivals (more revenue, less debt, smaller wages). Once Juventus move into their new ground, they will be a financial superpower by Italian football standards (considering the financial loses Milan and Inter run every year, and Roma’s dire situation). Great article! Had calciopoli never happened, I can only imagine how good Juve's finances would be looking right now. And Juve had plans to build a new stadium even back then. So Juve, who were 3rd in Deloittes Money League just a few years ago, could have been Europe's number 1 superpower right now. They not only would have incredible revenue, but they'd have balanced books. Hopefully Juve will get back to that point eventually....it'll take time though. Just a question on the average attendance of Milan and Roma in 09/10. They have 44.000 and 42.000 respectively. Are these figures in the Serie A only or are the European Competitions included? Looking forward to your review of the latest figures from Arsenal. SwissRamble, you wrote a very interesting article, as usual I would have to say, congratulations! 1) Top manager’s words are quite controversial. You mentioned Marotta saying “The objective is Champions League qualification” but I remember Andrea Agnelli saying “We can defeat any team” (or Alessandro Del Piero, not a top manager, ok!, stating “We have no limits, I want to win again here”). Maybe they should clarify their ideas. What is the real target for this season, provided there is one? They are really running the risk of either becoming ridiculous in case of missed ambitious targets (as it happened last year, when they started the season with the declared purpose of improving 2009 2nd place in Serie A but finished 7th with an all-time team record of 15 games lost in Campionato) or depressing their supporters hopes and expectations in case of minimum targets. 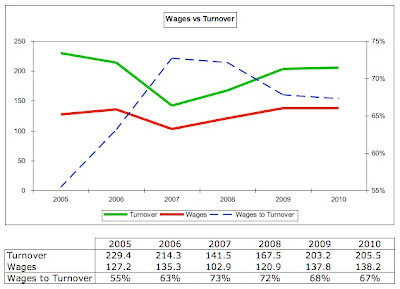 2) You write that “…(total salaries) have been increasing ever since promotion, but they are still only just higher than the 2006 wage bill, which is a rare event in a football world that has been subject to huge salary inflation”. This is true for sure, but I think you’re missing the relevant point: the quality of the players you’re paying. 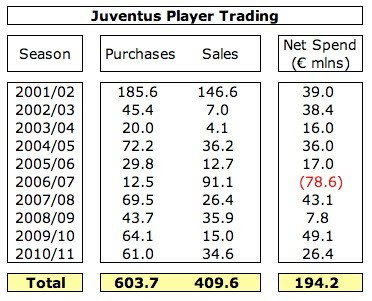 Dramatically, Juventus spent about 138 mln € in 2009 and 2010 for Amauri, Felipe Melo, Iaquinta, Legrottaglie, Grygera, Almiron and a lot of other poor players; in 2006 (more or less) the same amount of money was used to pay Cannavaro, Ibrahimovic, Thuram, Zambrotta, Vieira, Nedved and, of course, Buffon and Del Piero whose efficiency has sharply declined meanwhile. Does it make sense? Is it that worth? I can’t believe poor players like those can cost now as much as such impressive ones did 4 years ago: is this just salary inflation? 3) For sure, as you say, “Marotta has performed better than his unloved predecessor, Alessio Secco”, this was an easy goal to accomplish. But again Juventus bought a lot of average or enigmatic players for relatively big amounts of money: Bonucci (from Genoa, 15 mln €), Pepe (loan from Udinese, Juventus will pay for him 10 mln € in 2 years), Martinez (from Catania, 13 mln €). Aquilani, the former AS Roma midfielder, loan from Liverpool, has been suffering a lot of injures and played just a few games in the last two seasons: we can say he’s quite a bet, but nevertheless Juventus will pay for him 16 mln € in 2011 (more or less the sum Inter paid for buying Sneijder from Real Madrid last year). Now, wouldn’t it be better to try and invest money in just 2 “big names” instead of wasting resources in a lot of potentially uninfluential purchases? In my opinion, the real point is that Juventus is not yet perceived as a team that could be winning in a short time, neither in Italy nor in Europe. In other words, it’s not yet an appealing team, so top players are snubbing it and the quality of guys they can afford during transfer campaigns is low on average. 4) Regarding “the club’s vision of successfully developing young players”, winning a lot of youth tournaments does not mean the players will be suitable for Serie A. Juventus won Viareggio five times in the last eight years but the only player in the first team coming from “Primavera” is Marchisio, who could barely find a place in the starting eleven of other Italian and European top teams. Inter instead, in the same period, won Viareggio just once but produced one of the best Italian talents ever, Mario Balotelli (just sold to Manchester City for 28 mln €), whose contribution to recent successes (from 2008 to 2010) was remarkable (especially if you consider his young age, he was born in 1990). Finally, a short question. What is exactly the definition of “Match Day” revenues in Deloittes Money League? I’d like to clarify the reasons of such big differences between English, Spanish and Italian teams (Manchester United 118 mln is absolutely astonishing if compared to Juventus 17 mln!!!). Sorry if I wrote too much! Those average attendances are just for Serie A (excluding European competition). Thanks for taking the time to comment. Some interesting points. - higher attendance, United's average of 75,000 is considerably higher than Juve's 23,000. Similarly, I'd never guess that a club that has never won anything and has a puzzingly arrogant fanbase that have been football fans for all of 5 years could generate 125% of Juve's revenue. ^^^^^ well-said, anonymous! arsenal could only dream of having the same pedigree, or the same future! @ Matt - "I'd never guess that a club with a small stadium in a league with little appeal and dwindling attendences and audiences, and whose sporting results have been average manages to generate 80% of Arsenal revenues while having next to no debt. Kudos to Juve, Arsenal is not the only well-managed club after all ;)"
Could you disappear any further up your own arse? Juventus are Italy's largest club, with a trophy cabinet Arsenal could only dream of matching. Football didn't start with the EPL, you know. I'm french and a Juve's fan so i really appreciate your analysis. Full statistic and a great speech ! - Attendance: serie A is even behind the english championship! It only does marginally better than ligue 1 (source: http://www.thesportreview.com/tsr/2010/05/english-championship-crowds-above-serie-a-and-ligue-1/). - Juventus attendance itself is dwindling, in the late 90s there were almost 50K spectators per game, today it's 23K, that's a 50%+ decline (souce: http://bianconeri.tripod.com/fans2.html). To put that number in perspective, it's on par with Birmingham and West Brom in the EPL, Malaga and Espanyol in la Liga, Freiburg and St Pauli in the Bundesliga and Rennes in Ligue 1. - Juventus do have an extraordinary full trophy cabinet but since reaching the final of the CL in 2003, their last QF was in 2006. Likewise on the domestic front. Anyway you look at it the last decade has been a steep decline from the 90s glory. So considering all these facts the current financial state of Juventus is indeed very impressive and proves it has been very well managed. Good luck to them in the Juventus Arena! @matt : First of all the above data is open to discussion as one cant easily quantify how many supporters they truly have. Even if you a have a billion supporters but none buy any merchandise it is of no use. The no of fans is just used to brag about the club. they havent been to the qf since 2006 is because they havent played in the CL for 2 years out of 4 , reached last 16 in one year and last year was the worst is Juve's history. Stadio Olimpico is a 28,000 seater stadium , therefore the attendances are less and also Delle alpi was a bad stadium overall and fans didnt want to attend it , therefore the bad attendance. A well know fact is that all the away matches of Juve are sold out and the Juve supporters regularly outnumber the home support at the away matches. Bundesliga is having a better co-efficient because it does well in uefa , remember Italy have won 2 of the last 4 CL's and right now is the nadir of Serie A . Budesliga belongs to Europa and will once go back there after 2-3 years. obviously Juve is better run than Arsenal because the Agnelli's ( who own 60%) run FIAT and Ferrari which alone has more income than the top 4 in EPL. therefore they are very smart people. Juve has been suffering last 4 years because of the incompetence of the top management. A bandiera will never stop supporting Juve no matter what. Lets see how many will be supporting Arsenal if they get relegated. interesting read, thank you very much for it! With all do respect and I'm personally been following the EPL for the past 20 years. What makes you think arsenal will be the same team when Arsene wenger leaves them ?! I've seen Arsenal before Wenger was there and they were "nothing" like the team we're seeing today. Played a really horrible football and were 6-7th (can't really remember) before he went there. Juve last year had their "worst" season ever in their 106 years history and they still are doing pretty well financially. Am not a Juve fan but to compare Arsenal to Juve shows with all due respect that you have a bit of short info about European football. Anyways as I've followed European football for quiet some time now (20 years) IMO future looks pretty good for Juve not because of the financial side of the game alone but most importantly having a really smart president Andrea Agnelli. The man really knows alot about football and Many "gurus" of the game have praised him long before he became a Juve president (results so far support that). I was wandering about the differences in the P/L on player sales between the P/L accounts and the Player Trading table below. I have a few questions that I would like to pose to you privately, if that would be possible could you send me your e-mail to sportgamma@gmail.com? I'm a huge juve fan, but i must admit we are not back and nor will be for 3-4-5 years, maybe. 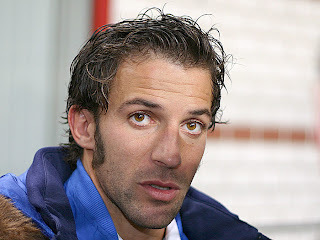 I have enjoyed your writings on Italian clubs such as Juve, Napoli and Undinese and appreciate your efforts. I hope you write about Palermo. Its owner Ziamparini is quite eccentric and outspoken. He is struggling very hard to let his clun stand on its own feet in the David against Goliath, in this case, Milan and Inter. I hope to read your insightful and informative ananlysis.